I did a research online, and people have been taking Biotin and they have seen great results in it. Their hair has grown faster, thicker and healthier. Biotin is a water-soluble B Vitamin. It promotes healthy hair growth and protects against dryness and breakage. Other than that, it is good for skin, as well as your nails. Biotin can be found in, carrots, cauliflower, fish, egg yolks, kidney, meat, nuts, oatmeal, oysters, peanut butter, poultry, legumes, whole grains and dairy products. I bought mine, at GNC in Pavillion for RM 48.90, for 120 tablets that contains 600mcg biotin in each tablet. They have a membership program, which cost RM30. The benefits are, if you buy the 2nd bottle you’ll get it for 50% off. So that’s a good deal, isn’t it ! The bottle describes that you need to take one (1) tablet a day daily, however GNC’s consultant suggested to take four (4) tablets a day. Two (2) tablets after breakfast, and two (2) tablets after lunch. She said that in USA, one (1) tablet contains minimum 5000mcg, as mine has 600mcg only. Did I see any differences ? Yes, I did see the difference. I have been taking it beginning April 2013, now my hair has less shedding when I wash my hair, still alot but it has reduced by 25%. The GNC consultant said, I can see the difference in three (3) months. Let’s see after three (3) months.. I will update on my blog how it turned out in three (3) months time, hopefully my hair will be healthier and thicker. I got to agree with this. GNC products are good! yes they are, looking forward for their other supplements..
hi. i was searching for biotin info and me google brought me to your blog. i cant wait for your result! The results are great for me, less hairfall. I’ve been taking Biotin for a month now, hopefully in the 3rd month I can see a significant change. Why don’t you follow me by e-mail or FB, so u’ll be updated once I posted on result on Biotin Hope that will help you consider to try Biotin. Is it alright to take 4 tablets a day I mean wouldnt that be alot ? Its oke to take 4 tablets a day, because in malaysia per tablet it just contains 600mcg bioti . If you compare with USA each tablet contains 4 times more. Hope this helps..
Hii there. Im looking for supplement to make my hair grow faster too ! Really miss my long hair. Since i did a really bad hair chop last month. Aiyaaakk. So, how about the biotin since youre taking it a month ago. Really need your experience to share with me. Is it really good ? Hi Sche, i Have finished like 6 bottles now (which means I have been using it for 6 months . And I can say that my hair is quiet frizzy becuz of the baby hair growing. Personally, I think its really good, my hairfall is less and more hair started to grow. 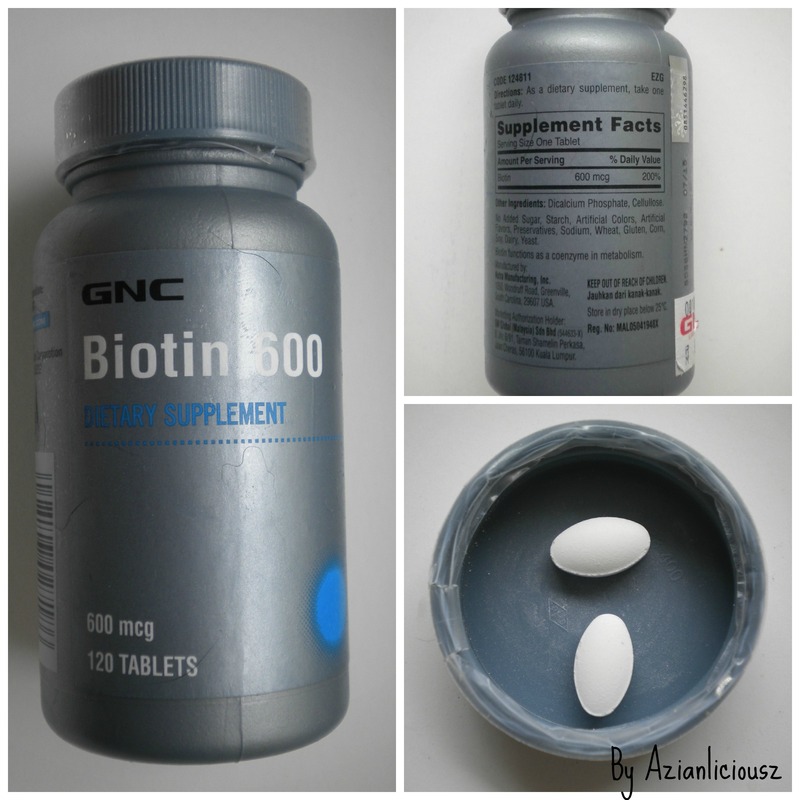 Hi, I’ve been taking biotin 600mcg from GNC for 2 months now, 2 tablets a day. When I first started it, my hair don’t drop that much (fyi, at the same time, I also use Regan hair tonic on my scalp & I wash my hair everyday in the morning as I have oily scalp). But lately I feel my hair drop quite a lot which worries me. Is it that biotin doesn’t suits me or should I take more tablets instead of 2? I’m really feel helpless! Hope you can help me! Thx. Hi Isabel, I am actually taking 4 tablets a day, i am not sure why your hair is shedding. Maybe due to hormone problem ? I think you should check with the doctor, it may be internal. But I guess you can try taking 4 tablets, 2 for breakfast, 2 for lunch a day, and see if your hair falls less. If that doesn’t help, I advice you to go see your doctor.. It really depends, because normally we trim our ends, so its difficult to measure..
My hair left area got hair putus putus. How? Thank you for the useful article. How is your progress so far?